View cart “Dual Lane Entry / Gate System” has been added to your cart. 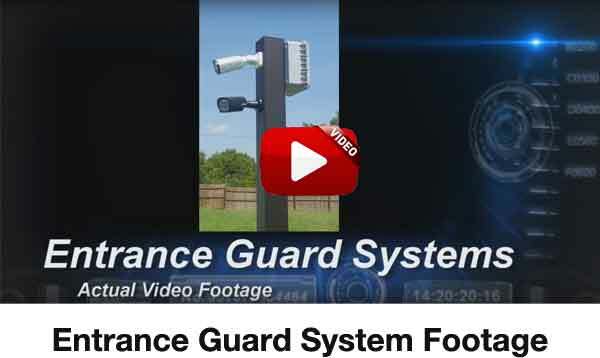 If you need a record of everyone that enters or leaves your Subdivision, Lot, Gated Property or a Remote Site, then our new stand-alone Entrance Guard Systems is an easy option. 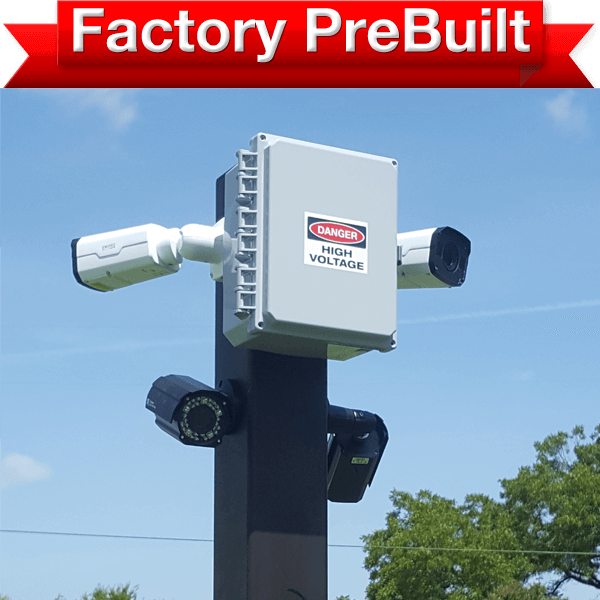 This unique outdoor IP System is state-of-the-art and records real time at 1080p HD, and can use H.265 to reduce file sizes and increase archive retention. What’s more, it has a built-in WiFi Hot Spot so that connecting with the system is as easy as pulling your vehicle within 100 feet of the system and using a laptop to completely control the system. You can look through the recorded archives to find vehicles recorded during a certain time frame, you can set the recording schedules and other settings. We give you two pieces of software: The first, Guard Station is for any Windows laptop, and gives you complete access and control of the system. You can set any analytics, recording schedules or even download archives of individual vehicles or blocks of time for later review. The next piece of software is an App for your phone or tablet, called Guard Viewer, which allows you to view Live and Recorded footage. It also can control PTZ’s, or can even record any footage you are watching or reviewing. We are offering these systems in several configurations as DIY Kits or complete Pre-Built factory systems. However, if you need a special configuration with more cameras, or even self-protection cameras that can record anyone that attempts to tamper with the system or cameras, just contact our Engineers. Depending on the area, your system may be vulnerable to damage. After all, to get the best views and to keep the License Tags in view for the longest periods, these cameras are mounted low enough that vandals could attempt to damage them. 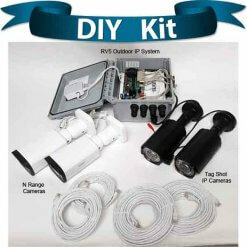 The heart of this system is our unique Outdoor NVR System, called the RV-5 from Rugged Cams. This 8 channel NVR can expand to include multiple lanes, self-protection cameras and more. As standard on our DIY Kits and Pre-Built factory systems, are two necessary cameras for each lane. First, the License Tag Capture camera, which is Rugged Cams’ TagShot-IP, is an HD-IP camera that records at 1080p, and has an electric 5-50mm long range lens that can be electrically zoomed to capture the exact width you need to detect license plates on a single lane of traffic. This “High Contrast” License Tag Camera is built for just one job – to capture License Plate numbers. Therefore, it only sees in Black & White (uses Infrared LED’s both Day & Night), and works best when it is situated no more than 30 degrees to the side and no more than 30 degrees above the plates it will be capturing. Of course, the correct way to setup a Tag camera, is to position it down lower and with the flow of traffic so that the License Plate is in view for the longest time (thus, more captured frames of the tag). This camera needs to be within 50 feet of the vehicle (15 meters). Of course, the closer the better. It also works best when the vehicles are traveling at no more than 30-35 mph (approx. 50 kph). The next camera, is the N-Range Bullet IP Infrared Camera, with an electric 2.8mm to 12mm Zoom Lens at 1080p. This “Overview” camera is used to record other information that will be needed to accompany the License Plate Reader camera, such as: vehicle color, possibly a driver and passenger (depending on window tinting and sun glare), as well as any signage on the vehicle or numbers on trailers. The system records video from any and all cameras. There is a time and date stamp on each. To search for vehicles, enter a time to start and a time to end and scroll through the archives at whatever speed you desire. When you see a suspicious vehicle, download the footage from all cameras that recorded it. The entire system only needs one 110 volt 15/20 amp circuit. The Cameras are POE powered. Any second monitoring locations will need to be wired via CAT5/6 (up to 820 feet away), and if you cannot wire to them because they are across a road, for example, you will probably need a second system. However, if the second set of cameras is at least 100 feet away, we can make the second set wireless back to the home system (line of sight is a must). We can even cover another 3rd Entrance/Exit if the conditions are right. Call our Engineers for your exact needs. 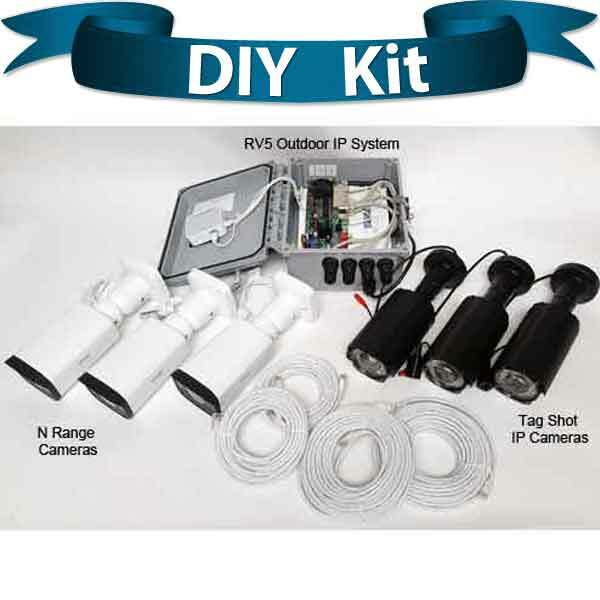 8 Channel RV-5 Outdoor IP System with two cameras (One Overview N-Range Camera, and One TagShot-IP License Plate Capture Camera) Comes standard with two 25′ pre-made cables – we will build cables at any length you desire at no additional charge (1 ft. to 300′). Longer cabling can also be provided – simply contact us. 8 Channel RV-5 Outdoor IP System with Two Overview cameras and Two License Plate Capture cameras (can be on the same pole if the lanes/entries are close enough, but normally will be mounted on two poles). Standard cabling is 2 25′ and 2 50′ cables – contact us with your exact lengths needed. 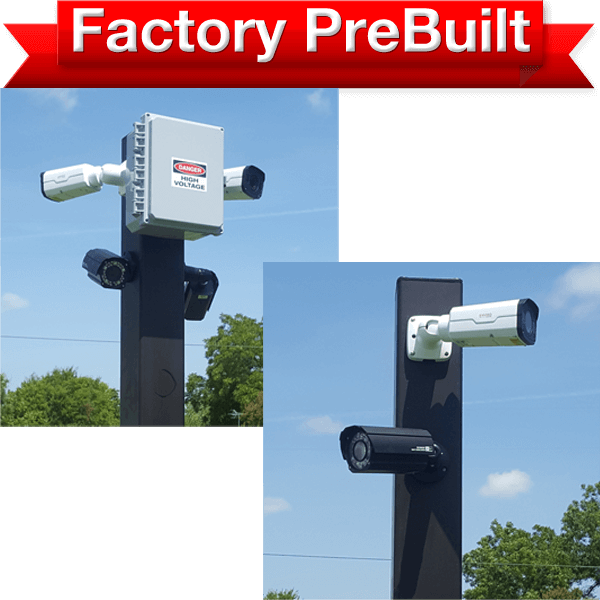 We pre-build and wire all cameras and the Outdoor NVR System on a pole or poles. All wires are hidden and protected. These poles are very easy to install as they are designed to be buried in a 3′ deep hole (just add concrete). A Power Junction box is supplied at ground level. 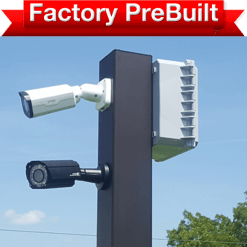 8 Channel RV-5 Outdoor IP System with four cameras (Two Overview N-Range Cameras, and Two TagShot-IP License Plate Capture Camera on opposing sides of the same pole – all prebuilt on a 9 foot, (5 inch square) buriable pole). Contact us if you need a different configuration. 8 Channel RV-5 Outdoor IP System with four cameras (One Overview N-Range Cameras, and One TagShot-IP License Plate Capture Camera on the main system pole, and One Overview N-Range Camera and One TagShot-IP License Plate Capture Camera on a separate pole– all prebuilt on two 9 foot, (5 inch square) buriable poles). Contact us with the length of cables between the two poles, and if you need standard or buriable cables. Also, contact us if you need any special configuration. Keep in mind that we are the Factory – so we can build whatever you need for your property, lot, subdivision or gated site. If you have power available at secondary sites, and line of sight is available, then we can build a wireless transmission system at a very low cost. Simply call one of our Design Engineers and we will design what you need quickly.